The quirky 50s Malibu furnishings of Henry Summer are the perfect backdrop for the, sassy, vintage-inspired and completely hilarious Fringe Show 5 Lesbians Eating A Quiche. Set in 1956 at the Susan B Anthony Society for the Sisters of Gertrude Stein annual breakfast and meeting (phew! ), we are introduced to four of the society’s well groomed, well mannered, but ultimately bad as hell, board members and ‘widows’. The men-hating, meat-loathing, lady-loving women are thrilled to be soon trying the best quiches in America and ultimately – spending time with one another. The society’s board president, Lulie (Cicely Binford) comes in a touch later and this is when the complexities of the ladies’ relationships really come to the fore. The show hints nicely at the complexities of female relationships, with much playing against one another to earn favour of another, backstabbing, rolling of eyes, undermining, but also – the support, unconditional love, fun and camaraderie close female friendships have. Everything is shaken up when a Russian bomb is dropped on the city, everything changes (bar their love of quiche and hatred of men), and as the women start considering the end of their lives and find they are gifted with a freedom to be themselves free of judgement, they embark on a journey of self -discovery, as quiche and eggs quickly become a metaphor for personal freedom and expression. 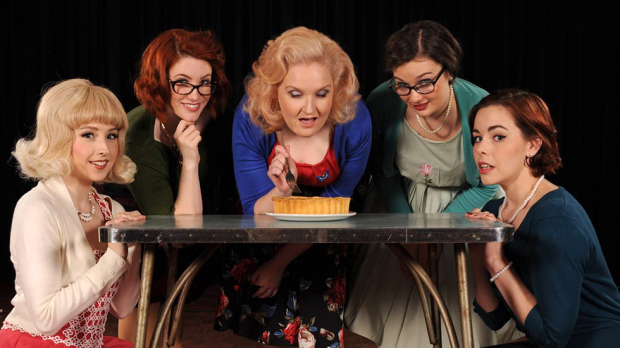 So don’t be fooled into thinking 5 Lesbians is a show about quiche, well yes – it is a show in part about appreciating eggs and quiche (because they are AMAZING) – but mostly, it’s a feminist tale of survival and the strength of friendship. 5 Lesbians is an upbeat, tummy-gurgling time that has the audience more than fully engaged throughout. In fact, it’s one of those rare shows where the audience actively involves themselves in the show and never feels alienated; this is thanks to the perfect measure of encouragement and engagement by the actors. It’s a lighthearted, soul affirming show that is carried off with aplomb thanks to the acting chops and comic timing of all the actors as well as superbly funny writing. Don’t miss it!